Cashews and raisins: 6 to 8 nos. Take a cup of maida in a vessel. 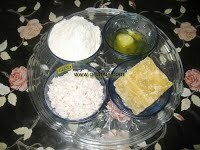 Add half table spoon of ghee and half tea spoon of salt to it. 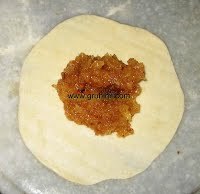 Mix well and make a soft dough adding sufficient water. Keep it aside for 15 to 20 mins. 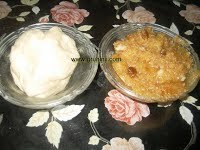 Take a pan and heat 1\2 table spoon ghee, add grated coconut and fry until it becomes dry. Now add mashed gud to it. Stir until the gud melts and thickens in a low flame. Add cardamom powder, cashews and raisins mix and keep it aside. Let it cool. Divide the kneaded dough to equal no. of small and big balls. 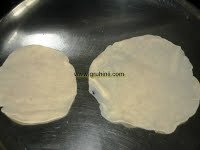 Now place a spoon full of the mixture in the center of the big chapati. 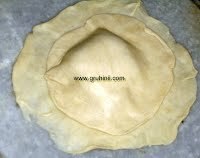 Close it with the small chapati and seal the edges properly. You can see the the picture. In the same manner make the remaining sun balls. Deep fry the sun balls until golden brown in a low flame. Drain, cool and store it in a airtight container.